But let’s talk about food — Chinese hot-pot from the previous post. Chinese hot-pot is almost a signature dish in Chinese cuisine, it is especially suitable for friends or family gathering. In Chinese we always use ‘re nao’ to describe this kind of occasions, it literally means ‘hot and noisy’, so you can imagine the hot steam going up from the middle of the table, and everyone is chatting over the hot pot while busy ‘cooking’ their own food. How to prepare hot-pot? — It is easy, at the same time, complicated. 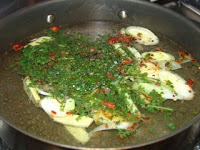 The easiest of way of making soup base for homemade hot-pot is to buy ready-to-use soup base. :)) You just need to boil it with water to make a perfect soup base, and they are quite tasty already, you don’t need to do anything else. 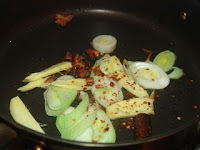 But sometimes, I am lazy to go out to buy, and my husband often complains about the ‘oily’ and ‘fat’ in those ready-to-use packages, so I started making the simple soup base at home, as what my dad used to prepare, or people in the past used to prepare. Here is how I simply made it. I normally prefer to make it seafood soup base with a little bit spiciness, but you can swap the seafood for meat, or leave out the seafood and meat, just have plain one. Oil, sichuan pepper corn, anise start, bay leaves, sea kelp, prawns (it is better with shell), crab legs (with shell), fish, salt, goji berries, dried chili pepper, ginger, scallion, coriander (optional). 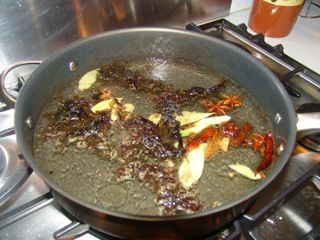 1) Sit the sauce pan (pot) that you are going to use for making ‘hot-pot’ over the fire, add in around 4-5 tablespoons of oil. 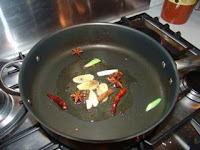 2) When the oil is hot, add in a small handful of sichuan pepper corns, a few dried chili peppers (depend on how hot you prefer), and a few anise stars. 3) Until the smell of the three ingredients rise up from the sauce pan (don’t get burnt), pour in hot water, covering more than half of the sauce pan. 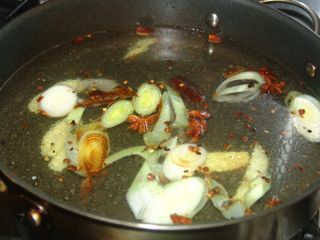 (You can remove the sichuan pepper corn, chili pepper and anise stars first before adding water, if you like). 4) When the water in boiling, add in couple of bay leaves, a few leaves of well soaked sea kelp, and say around 5-7 prawns with shell, a few crab legs with shell (if you cannot find it, it can be skipped), a few small pieces of boneless white fish, a small handful goij berries, a few sliced ginger, and 1 tablespoon of salt. If you like meat, you can leave a small chunk of beef or lamb in the soup base to boil as well. 5) Keep the fire low, boiling for around 45 minutes or more, allow all the ingredients well influence the soup. —- It is ready to be used for hot pot now.